The southern Peloponnsos, from Ormos Navarnou to Nsos Kithra and Akra Tourkovigla. Scale: 1 : 189.700. Larger scale plans of Kalamata, Ormos Navarnou, Ythion, Monemvasa (Yefira), Methni and Korni. For this 2014 edition the chart has been fully updated and modernised throughout. The sketch plan of Koróni has been replaced with a fully WGS-84 compatible plan, the plans of Órmos Navarínou and Órmos Methónis have been removed, and new plans Órmos Kapsáli and Dhiakofti have been introduced. Positional accuracy has been checked and improved throughout. 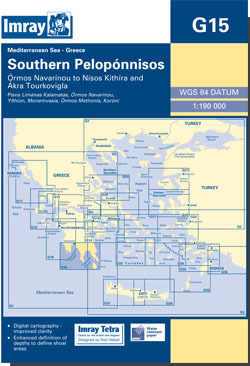 Imray Tetra Charts G Series Ionian and Aegean seas with coasts and islands in Greece and Turkey provide coverage of popular areas on sheets specially designed for the needs of yachtsmen.